The wicked 2017 hurricane season began delivering more punishing blows Tuesday as Hurricane Maria raked across the Caribbean with “potentially catastrophic” winds of 160 mph. 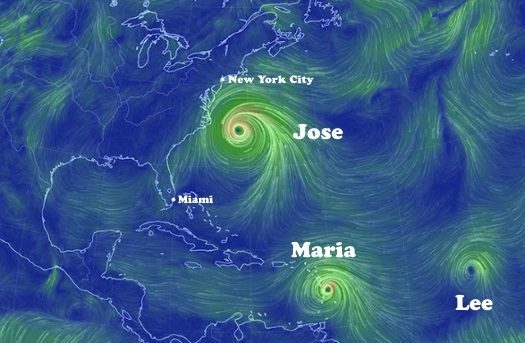 To the north, Hurricane Jose churned on a path to brush the Northeast coast with raging surf and potentially damaging gusts. Maria strengthened to the highest-level Category 5 on Tuesday after making landfall on the island of Dominica. 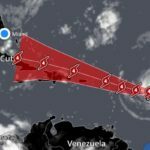 The storm carries the potential to cause widespread destruction along its path from the central Lesser Antilles through Puerto Rico, including some areas battered earlier this month by the huge Hurricane Irma. 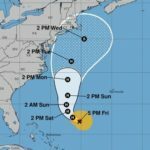 “Maria is forecast to remain an extremely dangerous Category 4 or 5 hurricane while it approaches the Virgin Islands and Puerto Rico,” the National Hurricane Center said Tuesday. Jose is capable of producing coastal flooding and pockets of damaging wind from eastern Long Island to coastal Massachusetts, its effects are most likely to resemble those of a strong nor’easter — rather than a devastating hurricane.